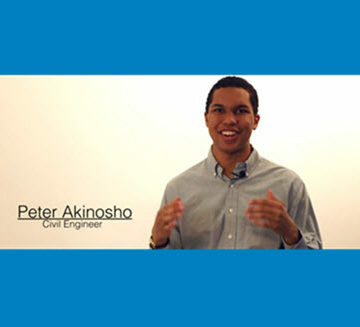 It doesn’t matter your line of work or your major in college – watch Peter Akinosho’s video about civil engineering and you might just consider a career change. Akinosho, S.M.ASCE, is a junior at the University of Georgia, pursuing a degree in civil engineering. 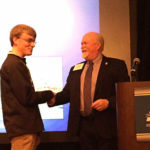 He is treasurer of the ASCE Student Chapter and a member of the school’s Concrete Canoe team this spring. He also happens to be an accomplished amateur filmmaker, working with sports, weddings and even an educational series, Classroom Unsquared. So when he saw that the contest celebrating the forthcoming ASCE IMAX film, Dream Big: Engineering Wonders of the World, had an optional video component, he got to work. “I decided to go for it, and I guess it just came together,” Akinosho said. The video demonstrates Akinosho’s infectious blend of -isms: notably optimism, enthusiasm, and idealism as he looks forward to a career in civil engineering. Even though he didn’t win the contest, it hasn’t dampened his -isms. Growing up about 30 miles northwest of Atlanta in Kennesaw, GA, Akinosho was fascinated by structures and roads, even building a toothpick bridge in fifth grade. 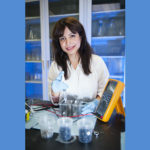 By the time he entered UGA, though, it was with a declared major of biochemical engineering. It was a presentation on campus by CH2M Hill on civil engineering aspects of the 2012 Olympics in London that changed everything. “I said, ‘I want to do this. This is cool. I love every part of this,’” Akinosho said. “I switched my major that night. For Akinosho, studying abroad last spring in Chennai, India, was an eye-opener. There would seem to be video production as a fallback.